Heat oven to 350&deg;F (180&deg;C). Prepare 18 large cookies according to package directions. Bake and cool completely. For each sandwich, turn one cookie upside down. Place a rounded scoop of ice cream in the center of the cookie; flatten slightly. Place a second cookie on ice cream. On a flat surface, gently press cookies together to form an ice cream sandwich. 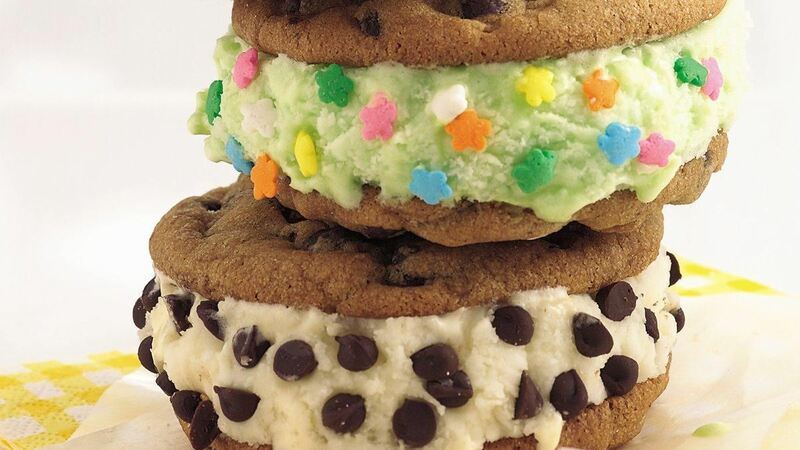 Ice cream should spread to edge of cookies. Quickly place sandwiches on plate, cover with foil. Repeat with remaining cookies. Freeze until firm (at least 2 hours). Tip: When you want to involve your children in the kitchen, but don't have a lot of time (or maybe energy! ), try having all the cookies baked ahead & let them help with putting them together & wrapping them up for freezing. They will still think they made them all by themselves.